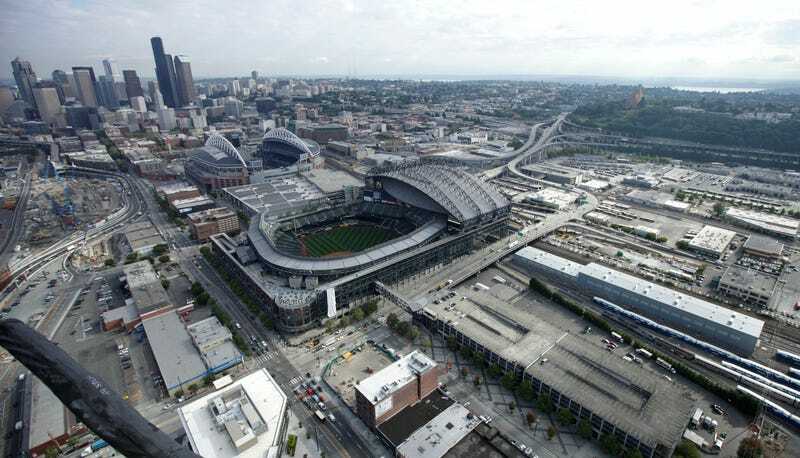 Earlier this week, the Seattle City Council announced a tentative agreement on a new arena, to be built in the Sodo (south of downtown) neighborhood where Safeco Field and CenturyLink Field already stand. The revised plan is the product of months of negotiation with hedge fund investor Chris Hansen, who's long made it his goal to bring an NBA team back to the city. The city, wary of the money pit that is the publicly financed stadium, sought concessions from Hansen, and got some. More details of the plan are here and here, but all you need to know is this: now, practically the last thing standing in the way of an arena rising on the site is Hansen finding a team to buy and move. Well, that and the Mariners. Mariners VP Bart Waldman was among the signees of a letter sent to the city council yesterday, complaining that the Sodo site has been "pre-selected," and the city's obvious favoring of that specific plan is going to prejudice the environmental review that must take place before ground can be broken. "We believe the (agreement's) pre-selection will prejudice the thoroughness and credibility of the EIS' alternative site location, will taint its adequacy, and constitutes an impermissible 'action' taken without SEPA review," Wednesday's letter states. The letter points to language in the agreement that states, "The Arena will be located on the Project Site, which is south of downtown Seattle." Many of the agreement's provisions, the letter argues, are based on the proposed site in Sodo where Hansen already owns property. The Mariners insist they're not concerned about competition, but what else could it be? From a financial standpoint, a baseball franchise isn't competing with other baseball teams. It's competing within its own town, with the football team and the movie theaters and the restaurants and you can't expect the Mariners to welcome a new arena with open arms. At the bare minimum, it's an entirely new Big Four sport peeling off residents' leisure spending. It's also concerts and events now being hosted a few blocks away, and probably an NHL team too. But this competition would still exist, though not as hearty, if the arena were built in Bellevue or elsewhere. So what if the Mariners aren't trying to stop the deal going through, but only trying to delay it? There's a theory I quite like, one that notes that the Mariners have an opt-out clause in their TV deal with Root Sports, one that becomes available in three years. It'd be natural to assume that the next step is their own regional sports network. RSNs are the wave of the present, and for now at least, can print money at will. The M's, with all their Japanese benefactor cash, would be foolish not to start their own RSN, and probably want to do so at the first opportunity. But that opportunity doesn't come until 2015 at the earliest—by which time Hansen might have revived the SuperSonics and started his own network, and Seattle's not a big enough city for two RSNs. If there's anything to this theory (and there's no evidence beyond logical conjecture), the Mariners don't need to stop the Sodo arena, don't need to keep basketball from returning to Seattle—they only need to drag the process out a few more years.